It is possible to generate two-phase liquid-liquid systems in which both phases have high concentrations of water. One way is to dissolve two polymers (differing in their chemical structure) together in water (Albertsson et al., 1981; Walter et al., 1985; Albertsson, 1986). Between these two water-rich layers proteins can be partitioned. 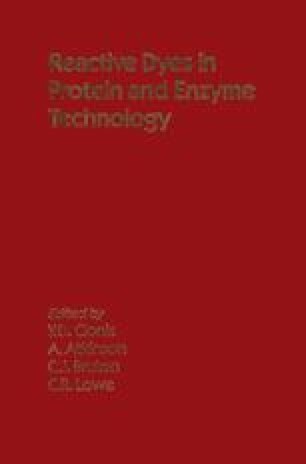 Differences in the partitioning make it possible to resolve protein mixtures by liquid-liquid extraction. Many pairs of water-soluble polymers give rise to two-phase systems but their usefulness is often limited by high viscosity and extreme separation time. The most widely used two-phase systems have, until now, been those composed of dextran and polyethylene glycol (PEG). This chapter is therefore limited to this kind of aqueous two-phase system. Triazine dyes, covalently bound to the polymers, have been included in the systems to obtain selective liquid-liquid extraction of dye-binding proteins from mixtures such as cell homogenates.